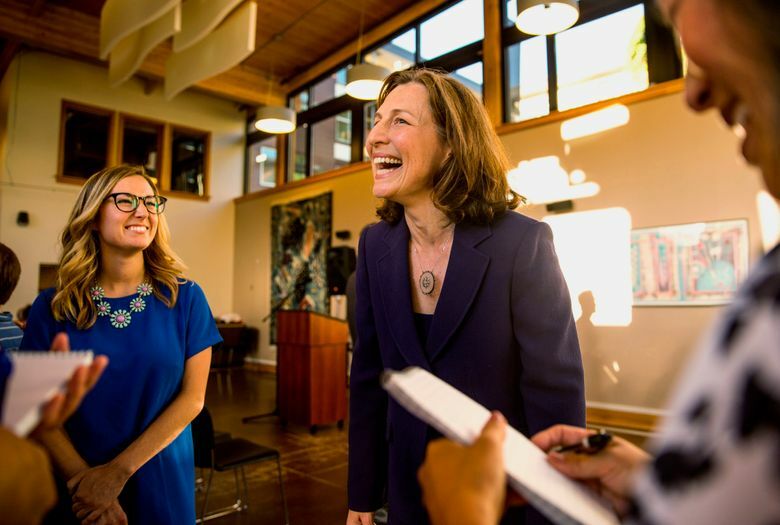 Issaquah pediatrician Kim Schrier makes the case for why she could be the first Democrat to represent the 8th Congressional District. She’s a first-time candidate for public office facing one of the state’s best-known Republican politicians. Kim Schrier, an Issaquah pediatrician, could help flip control of the U.S. House of Representatives to Democrats this fall if she manages to defeat Republican Dino Rossi, the three-time statewide candidate still looking for a big win. Schrier recounts how a meeting with Reichert’s staff on the GOP healthcare bill led her to enter politics — and why her experience as a doctor and mother is relevant in the 2018 midterms. Like many Democrats, especially women, Schrier was alarmed by the election of President Donald Trump. It motivated her to get more involved and led her to run for office. But she doesn’t want to make the 8th District race entirely focused on Trump, saying people need a reason to vote for Democrats, not just against the president. While polls show many Democrats want to see Trump impeached, Schrier dances around a question on whether Trump has committed impeachable offenses. She does say the GOP majority in Congress won’t fulfill its duty to act as a check on the White House. “What we know is the current Congress will not take any action. The current Congress that is the Republican majority won’t do anything to stand up to this administration,” Schrier says, adding that Rossi can’t be trusted to protect Special Counsel Robert Mueller’s investigation into Russian interference in the 2016 election. Like many Democrats, Schrier has been critical of the Republican tax-cut bill for giving the biggest share of tax cuts to the wealthy. Running in a district that depends on immigrant labor in orchards and farms, Schrier says she’s been dismayed by the “scapegoating” of immigrant populations by Trump, which echoes dark times in history. “I think this is a way of stirring up a frenzy and isolating a group I think that should make us all concerned,” says Schrier, who supports a standalone DACA bill to protect “Dreamers” – youths brought to the country as children. Who is the real centrist in the race: Schrier or Rossi? What’s her argument for a move toward a single-payer, Medicare for All system, and how could it be funded? Does Schrier support a tax on carbon to fight climate change? Should Snake River dams be breached to save threatened fish runs and orcas? What did Schrier mean when she compared running for Congress to World War II? Why does Schrier believe 8th District voters will elect a Democrat to Congress for the first time?